This title helps to find words up to 64 times faster than with a standard dictionary. 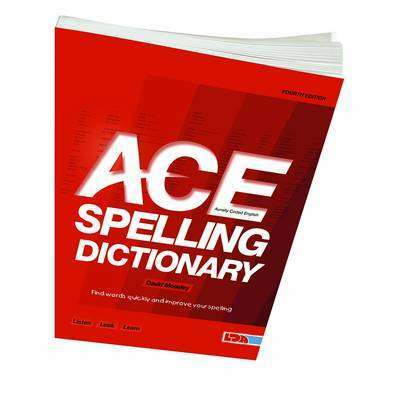 "The ACE Spelling Dictionary" is now even better that it was. With this fully revised new edition, we have made a number of important changes. This includes updating and extending the vocabulary, giving more alternative spellings, more plural forms and more 'sound-alike' words with meanings. The middle section is a darker blue to make it easier to find the right page. It is clear that pupils with spelling difficulties often experience problems with the whole curriculum and lose confidence with writing. "The ACE Spelling Dictionary" breaks through these problems. Using the unique 2-page index spread, pupils need only think how a word sounds to find out how to spell it. By simply identifying the first vowel sound, the speller is sent instantly to the page where the problem word is found. The easy-to-use reference system will tempt them to use more interesting words in their writing, enabling them to produce work that they can be proud of.